The Free Online Receipt Generator tools provides you blank receipt templates with different styles which can be filled by online by entering the details in it. Without any effort or consuming much more time on creating your own new receipt template and then filling it, you can enter the data you’re desired (contains both of your own/business details and the buyer details with the queue date). After filling all the required fields and confirming that the receipt is ready to send to the recipient, you can save and download it as a pdf or can print it. Yeah, there are many types of receipt and invoices templates in which fields are different to be forwarded to the receiver/buyer. Below are few examples for your info. Money Receipt: In this type of invoice, all the details of transactions entered that are done by the money. In money receipt, all the details about payer and receiver, date, day and total amount are written down. Rent Receipt: This is an agreement of house rent which includes the details of landlord and tenant. Names of both, Contact information, Address, Payment date and signatures of the both persons are taken in this. You can find rental receipt by searching on the web as there are available for free (or wait for our next post, we may bring huge templates for you). Tax Receipt: This is the documentation between the seller and other registered dealer and is prepared when seller sells goods to the other dealer. Usually, it contains the contact/address information of both of the seller and buyer, names of both, sales details. And this is mostly prepared by already most of companies. There are lots of websites which offers free Tax invoices which can be downloaded and can be used. Similarly, sales, purchase, industry, shipping invoices are the examples which can be used according to the condition you have. Why You Should Use Free Online Receipt Creator Tools? Now, let get started with the list of best and free online invoices generator tools that generates invoices for your free of cost. With the below tools, you will be able to create a free receipt by filling the boxes through the information required and then can either print or can download as a pdf file format to your computer. Let have a look…. Invoice2Go is an invoicing service designed by a small business owner to help you get paid no matter where you are. Perfect for freelancers, contractors, or small business owners, the app lets you easily create and send customized invoices from your phone, accept online payments from customers, and track your receipts. Performance reports and graphs are automatically generated to keep you informed and your business on track! Redoreceipt is a useful online tool that can be used for making receipts easily. Actually, it provides some pre-made receipts in which you can make editing as of your wishes and can then save to your account. It is famous for taxi, restaurant, rental, pizza etc receipt maker. ​With InvoiceHome, you can create professional invoices and receipt templates in seconds. This invoice generator was created specifically with small businesses and freelancers in mind to deliver a simple and intuitive interface. InvoiceHome also offers easy paypal integration as well as the option to email your invoice directly to the recipient to ensure you get paid quickly and effortlessly. They offer over 100 templates as well as the ability to add your own logo. With the help of http://www.fakereceipt.us/, you can create a custom and free sales invoice. Without having any skills, you will be able to create a receipt there. What you have to do is to fill the blank text boxes with your own information. There are three main steps that has to be done. Let have a look what are these. Seller Information: It contains Seller slogan, Store name, Address, City, State, Postal Code, Cashier, Customer, Payment method, Return Policy (Select an appropriate). Purchases: In these boxes, you have to enter the items with prices and taxes (name & rate in percentage). Once this completes, look further for the third step that what you’ve to do. After that, click on the button update/create receipt, and you are done. You will see an image when the page reloads so right click and download. Cons: We noticed that the website don’t offers the created invoice to be downloaded in pdf file format, in case you need in pdf format, you will need to do an additional step that is converting image to pdf using free online pdf conversion tools. The website http://www.makereceipts.com let you create an invoice for the gas. In order to start creating the receipt for gas using this tool, it asks you first to calculate fuel totals to be entered automatically. So enter the price per gallon or litter in the first box and number of gallons or litters in the second box and click on calculate total price button. Once you had clicked on this button, the total prices is calculated automatically in the quantity to price section. Gas station Details: Fields to be filled are Country, station name, street address, city, state postal code, area code or phone and taxes applied. Fuel Purchase Details: It contains measure (select gallon or litter), product type, quantity, price per selected measure, cash paid, credit card paid, credit card name and credit card last 4 digits. Once, done both of the sections, click on the button create/update button and you’re done. Let the page reloads and see the preview to download. 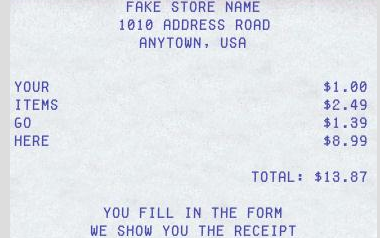 Yet another great tool for creating a receipt just in few moments. You will be able to create an invoice in three easy steps using this website. The Three steps you’ve to done are as below. Add billing address: It includes your own details i.e company name, city, country, state/zip etc. Once you’ve dome the first step, click on next which bring us to the second step. Your client Address: In this section, you have to enter the detailed address of your client that is to whom you want this receipt to be sent. So fill the required fields and click on next to see the third step. Describe your work: Now you are in the third and last section. In this section you’ve to describe your work. You can add items, description, Unit cost, Qty (Quantity i.e how many items), taxes (if any, click to add tax details). Once you’d done all these three steps, click on the green button “Alright, I’m done”. After clicking on this button, it asks you for adding some additional things like Company logo, Notes, Terms. So click on Continue editing if you want to add these additional information or click on “Save and Send” button. Now you can either send it directly through email by setting up your email there or can download as a pdf file. With Fastdue, you can create your own professional receipt and can send it to someone directly. you can add your own logo and all the details that are required. Also you can attach a document and can add additional comments for your payers. Once you had created your invoice with fastdue, you can see its preview and can send. Usually, verypdf provide free online and offline pdf tools. But you can also use it as a free receipt maker in pdf format. Visit verypdf/invoice website, you will see a pre-made receipt template in which you can do changes as you desired. So click on one by one and add your own/receiver information in the template. After editing all the fields including top lines notes, description, quantities, items, individual & total price an bottom notes, look at the right side, you will find two options that are save pdf invoice or send pdf invoice so click on an appropriate button and thus you’ve created afree pdf invoice. Use invoice-generator if you want to create a professional receipt online for free. You don’t need to be skilled in order to create your own receipt. Without having any skills, you will be able to create an invoice just in few moments. With its simple and easy to use interface, it generates a free invoice for you. With other information, you can also add your own logo to make your receipt more professional-like. Fill out all the fields and click on “Download Invoice” button presented at the top. You will be redirected to a page to download your receipt in pdf file format to your computer. While I was making the list, this tool weren't there and I didn't included this in my list because I was unaware of this tool. But thanks to our reader "Mochi" that he suggested this one to use. I looked at that site and found it helpful. So i decided to jump again to my post and edit it. Let see what this can do for us. With using Invoiceape, you can start creating a professional invoice, it has few pre-made templates from which you can select one with meets your desired look. After selecting a template, you can select page size as you want. Select a colour theme: There are different colours you can apply to your invoice, so select that one which looks perfect to you. Your logo: you can add a company logo to the invoice. Basic Information, Document Information, Your information, Customer information, Transaction Information, Some additional information can be added using this website which is a usual for an invoice. Additionally, you can add your own signature or specify your terms. That’s it dear readers, I hope you found out today post helpful. Please don’t forget to share this post on your social network profiles. We Appreciate Comments on this post... Feel free to share your own online invoice maker if you have one which is not listed above. I suggest invoiceape.com which was a recommendation from my friend. Mochi, you had mentioned really a great and a nice website for creating an invoice. I visited it and found it useful. Thanks for coming and leaving your valuable comment on Tech Web World. would like to add Invoicera to the list of tools. It is a feature rich software that combines online invoicing, time tracking and task management. Invoicera allows you to generate free unlimited invoices for your clients. Thank you John for your comment, I will surely look at invoicera and would like to add it to the list above. Thanks for visiting our site and sharing your thoughts. Can you elaborate what do you want to say? Amazing work done here. Btw in your oinion. which is best for making bus ticket or a hotel bill. Also if Expressexpense is blocked? ?